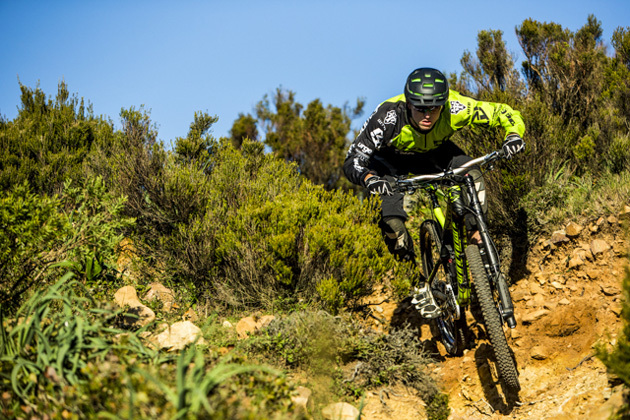 There’s a lot of news coming from Cannondale Bicycles this spring, and we’re in Spain’s sunny Costa del Sol to soak it all in—and, to be perfectly honest, it’s hard to decide where to actually start. 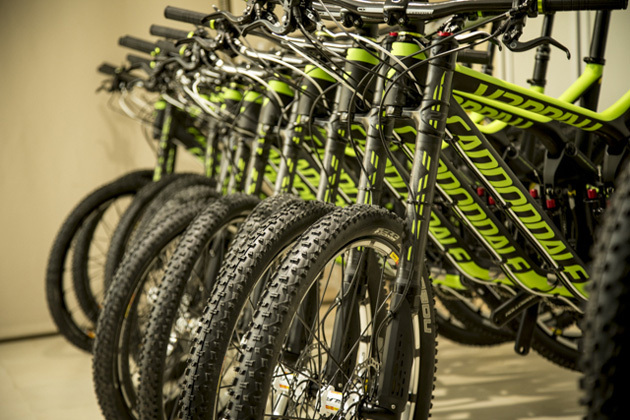 We might as well ‘pull the trigger’ on Cannondale’s new Trigger with 27.5-inch wheels and the company’s redesigned SuperMax Lefty fork, which all of the OverMountain team members played integral roles in developing. 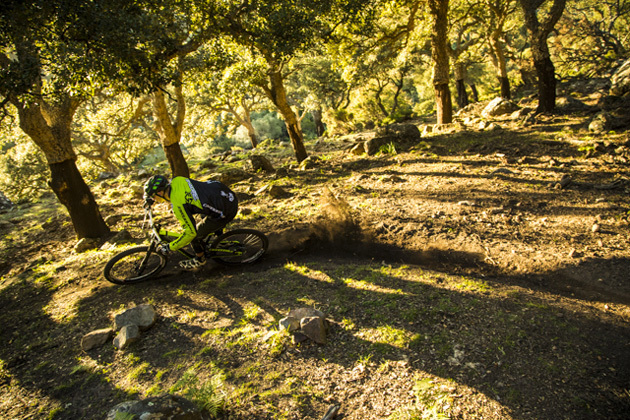 The motley crew of international journalists assembled here was treated to a satisfying ‘first ride’ of the new Trigger on some seriously sick trails near the town of Sotogrande, known more for its golf resorts and timeshares than for the untrammeled singletrack that laces the sun-baked hills that rise up from the Mediterranean Sea. 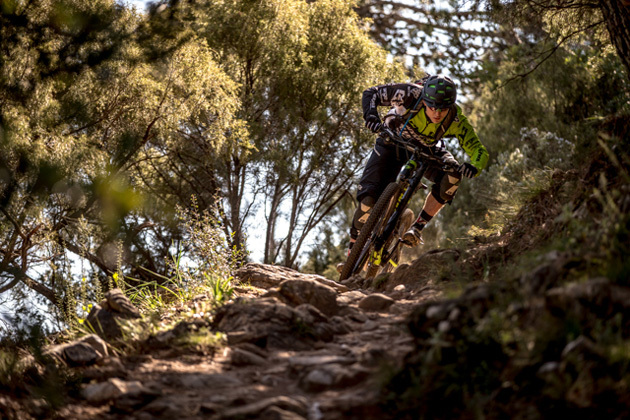 The newest addition to Cannondale’s OverMountain enduro racing team, Marco Osborne, has a tendency to get down meaty trails pretty damn quick, and the Trigger is one of his two weapons of choice. 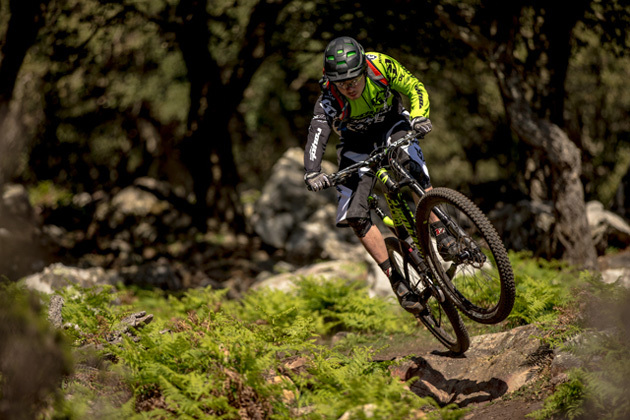 Keep an eye out for the latest protege of Mark Weir on the enduro circuit this season. You won’t be bored. Photo by Jake Hamm. 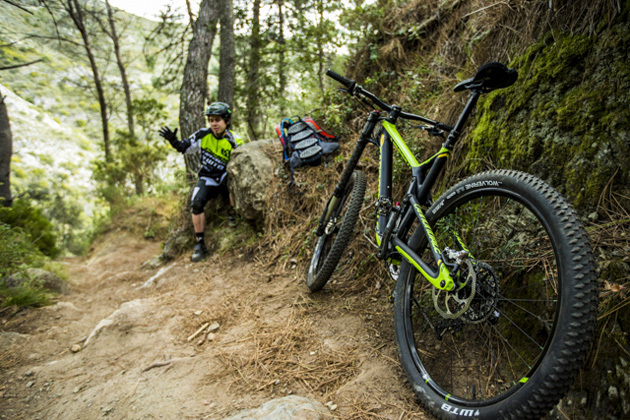 On the types of trails that characterize southern Spain—rocky, dry and loose marble beds rolling through ancient terraced farmland—I much prefer the new 27.5-inch Trigger to the Trigger 29, mostly because of how tight the trails, and turns, actually are. With the smaller wheel size, there is much less need to outrigger around corners, yet the wheels are still large enough to get good rollover through fields of baby heads that pretty much resemble the Sphinx of Giza. The new SuperMax Lefty fork, when paired with Marco Osborne and the new Trigger, was pretty point-and-shoot. Photo by Ale di Lullo. Apart from having a great day riding a new, lightweight carbon-fiber bike in splendid weather, I also got along really well with the Trigger’s sensibly adjustable suspension platform—which allows riders to toggle between the shorter-travel ‘elevate’ mode and the longer-travel ‘flow’ mode. The elevate mode was obviously super-handy on the fireroad climbs, but when it came time to descend, I kept my suspension in the longer-travel ‘flow’ mode. For Marco Osborne and Ben Cruz, having a great time is a pretty simple proposition. Photo by Ale di Lullo. As should be expected when becoming acquainted with a new fork and shock, it took me a while to find a sort of ‘sweet spot’ where I felt my travel was balanced. I started out the ride with slightly lower pressure in my shock and fork than is recommended on the Cannondale charts, and I consistently sped up my rebound a click or two at each stopping point to see if I could find a nice balance between the natural plushness of the platform and its ability to plow through consecutive square-edged hits. About halfway through the ride, I realized the err of my ways and increased the air pressure in the fork and shock to the recommended levels—a move that contributed to much more confident riding for the remainder of the day. We probably don’t need Ben Cruz to teach us that getting your front wheel up is much easier on a 27.5 than a 29er…but these lessons are always fun to watch. Photo by Ale di Lullo. I’ll save a lot of my thoughts about the new Trigger until I’ve had considerably more trail time on the bike, but one area in which I really noticed it excelling was in popping up and over step-ups while launching out of the periodic G-outs that result from crossing dried-up stream beds. With a wee bit of anticipatory downshifting, I felt like blasting up these punchy little climbs was an explosive affair. Which of these Triggers would you pull? Photo by Jake Hamm. No stranger to guns of all shapes and sizes, Ben Cruz can talk all day about his itchy Trigger finger…. Photo by Jake Hamm. 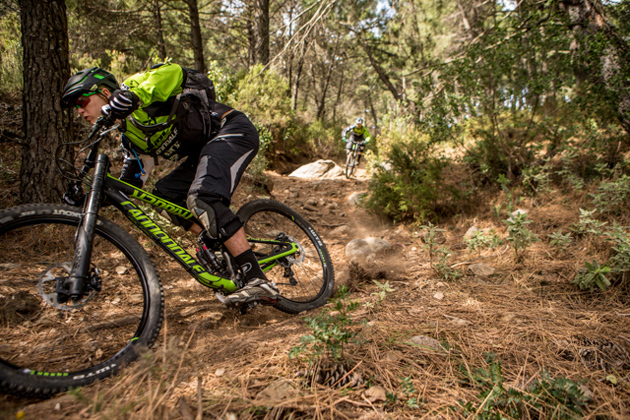 Ruling the roost is not so easy when you’re riding with Cannondale’s OverMountain enduro racing team. Every turn is an exercise in humility. Photo by Jake Hamm.